Byzantine Architecture - architecture of the Byzantine or Eastern Roman Empire centered in Constantinople. For this lesson I focused on Byzantine church architecture. After the conversion of the Roman Emperor Constantine to Christianity, Christians could begin to erect permanent structures for worship, baptism, etc. The first churches in the Roman empire were built in the basilica style. See http://hereisthechurch.wordpress.com/2011/04/27/basilica-architecture/ for an overview of basilica style architecture. Eventually Byzantine artists in the eastern portion of the Roman empire began to break away from the classical styles and created a new style filled with symbolism and a magnificent use of space especially through the use of a dome to represent the "dome" of heaven. STORY: I read from the Story of the World: Volume 2 The Middle Ages for this lesson. There is a chapter on the Byzantine Empire. I did not read the entire chapter as I try to keep the story portion of class to 5-10 minutes. 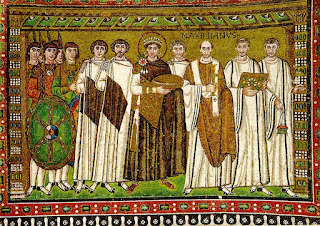 I just pieced together parts of the chapter and gave them a quick overview of Byzantium as well as focusing on Justinian. 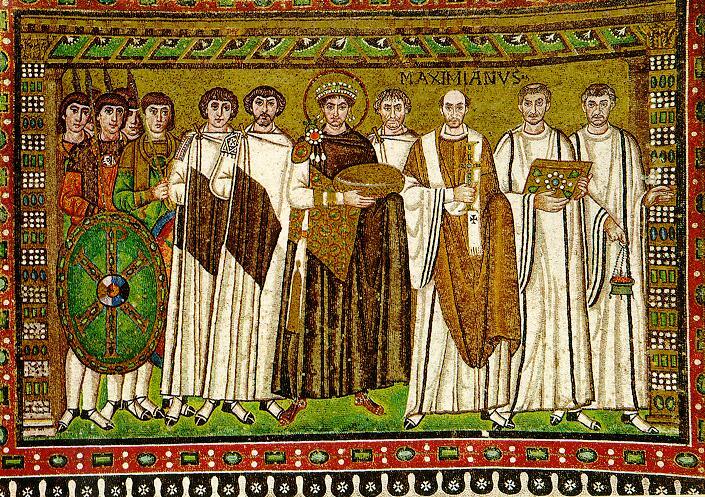 The Emperor Justinian was the most important ruler of what came to be known as the First Golden Age of the Byzantine Empire. He completed many important building projects in Constantinople and Italy during his reign including the beautiful Hagia Sophia Cathedral. 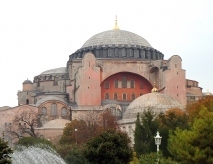 The Hagia Sophia was rebuilt by Justinian after the previous structure was destroyed in a fire. It is considered to be the epitome of Byzantine architecture and served as a model for many other churches. The chapter in the Story of the World gives a nice description of the Hagia Sophia, especially the dome and mosaics. It is best to do this lesson before the other Byzantine art lesson I posted as this will give the children a basic understanding of mosaics. 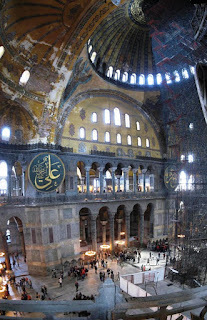 I focused on the Hagia Sophia Cathedral and showed the children various photos of the exterior and interior. There are many photos on the internet (see http://www.hagiasophia.com/listingview.php?listingID=19&name=Gallery) and I have included some here that are in the public domain (click on any of the images here to see them larger). You might mention to the children that the minarets were added later when the area came under Ottoman rule and are not original to the design. I explained a bit about the different types of early churches. The first churches and other Christian buildings were based on either rectangular Roman basilicas or round-domed structures also known as central-plan churches. 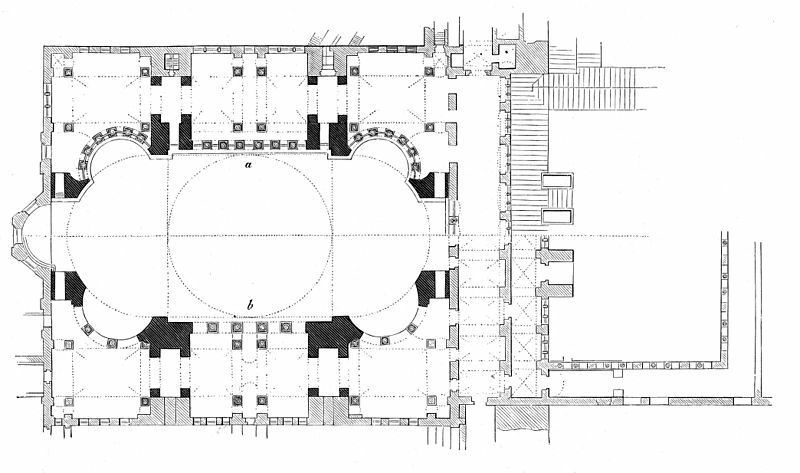 The basilica plan churches usually included an atrium (a forecourt), the narthex (an entrance or lobby area), a long central area known as the nave and an apse (a semicircular projection). Sometimes there is also a transept that crosses the nave horizontally near the apse. 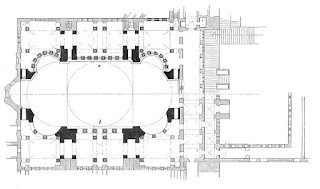 With the transept the building is T-shaped and known as a Latin-cross plan. Central-plan structures with domes over the center were first used as tombs, baptistries and shrines to martyrs. Central-plan churches usually have an atrium, a narthex and an apse, but the nave is usually much shorter. In basilican churches the focus of worshipers is drawn toward the apse. In the central-plan church the dome is the focus. As mentioned above, the dome functions symbolically as the "vault of heaven" and draws the gaze of worshipers upward. Often a fresco or mosaic of Christ Pantocrator is found inside the central dome. The central-plan church (also sometimes referred to as the Greek-cross plan) is characteristic of Byzantine church architecture. If you have access to the Marilyn Stokstad Art History book (volume 1), there is nice example of these two types of church architecture in the Early Christian, Jewish and Byzantine Art chapter. This quiz that goes along with the Art History book I mentioned shows a nice example of a central-plan church (the answer to the question for that diagram is C: atrium, narthex, apse, dome) as well as a basilica church plan at the bottom of the page. PROJECT: We did a very simple project for this lesson. I gave the children pencils, markers and paint and had them design their own Byzantine style building. I included some gold paint since the use of gold is very prevalent in Byzantine art and architecture. I used standard sized white card stock for their pictures so they would fit in their 3-ring binders and the card stock is sturdier for painting. You can use any kind of paper however. Another idea if you would like to focus on the layout of the interior of a Byzantine style church (or a basilican style church as a contrast) is to have the child(ren) build a floor plan of a church out of some sort of blocks (such as wood blocks, Legos, etc.). Then you could point out the different areas such as the narthex, apse, nave, etc. This would be a great project for the kinesthetic learner. And here is a link to the other lesson I posted on Byzantine Art. My children would love this! Thanks for creating this new blog!